This car falls into the same category as the Mercury Monarch I wrote about a few weeks ago. It’s a dented working car. It’s a pretty ordinary car too, possibly even more ordinary than the Monarch. It’s a small, front wheel-drive monocoque vehicle from the lower end of the price range. The engine is mounted transversely and the front suspension uses McPherson struts. In concept terms, it’s the same a VW Golf. Or, in image terms, think of it as a Rover 45 saloon with sporting accents. What was the 1980-1985 Skylark? Buick launched this car on the front-wheel drive X-platform and it differed little from the Chevy Citation, Pontiac Phoenix and Oldsmobile Omega. It was among GM’s first batch of front-wheel drive cars. These all used the X-body and shared a range of engines including the dreary old Iron Duke in-line four and some smaller capacity V6s supplied by Chevrolet. Judging by the headlamp design, it’s an 1982 model. The car is clearly a used-daily sort of car rather than being a cherished heirloom. Rust spots have been fixed quite carefully though the work is not to the standard of a body-shop. The chrome bezels on the headlamps are cratering somewhat and the Tri-Shield badge shows the effects of UV damage. I had a look at the chrome trim around the side glass. The joins are simple overlaps, similar to the way tiles are fitted to a roof. Looking at the headlamps one sees screw heads – it could be a household exterior service lamp, such is its lack of finesse. Notice also the very obvious vertical splits between the rear metal work and the tail assembly. Here is where the Buickness was just bolted on. Inside the car (not shown below) I saw a very odd thick-pile, saggy black velour on the inappropriate bucket-esque seats (as well as the usual assortment of litter). The seating material looked like something you would use for a sinister soft toy. I could not find any images of this and couldn’t take a photo, hence the stock shot I have used. I suppose the designers wanted to convey sportiness by making it entirely black inside. 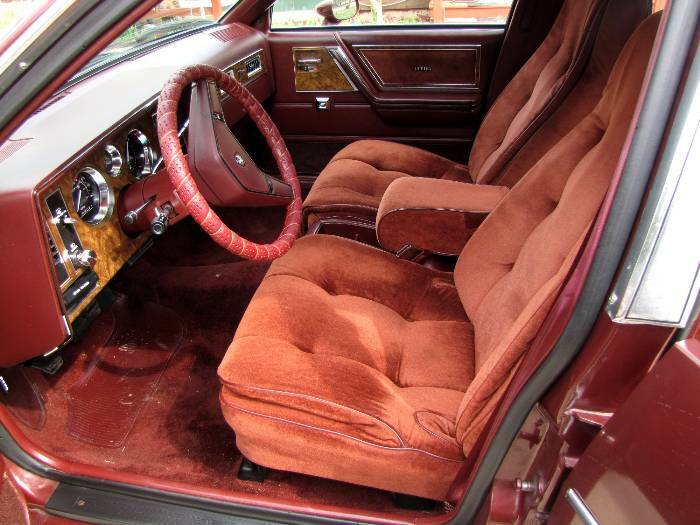 The reference photo shows that the more typical Buick Skylark interior had some charm. To understand the contradiction of the Skylark Sport concept you need to imagine designing a car for comfort to suit slightly conservative owners and then do a version that appeals to people who like sportiness and think of themselves as not conservative. Pontiac were supposed to do sportiness and had their own, slightly more athletic entrant in the market, the Phoenix. Clearly GM did not know how to demarcate these models. Did one buy the Pontiac or the Buick? Much as I like this kind of car and have fond memories of my not-too-disimilar ’84 Century, this car is a less than lovely example of a less than lovely car. I am sure the owner adores it and I wish them many more happy miles of safe and, above all, comfy but slightly sporty driving. Even before I read your elegantly. well-judged comments, Richard, I was looking at the photos and thinking that this looks like a car that was productionised (not a word?) by a house builder, rather than an engineer. It´s great to see someone takes car at a car that will never become a popular classic youngtimer – and there are a lot of good reasons for this Buick skylark for not being really popular. With his weak engine and a slow slushbox, he will be nearly as fast as a schoolbus – and has nearly the same fuel consumption…. would have bought a Peugeot 305 or japanese reliability instead. By the way, i really love the design of the 1993 Buick Skylark Coupé. Yes, I like these “ordinary” cars being looked after. I get bored seeing Cadillacs and muscle cars as the Detroit options. I reviewed the 1993 Skylark today. It has details that suggest the designers wanted to work with a larger car. The dashboard is very spacey indeed. I wish the bodyside moulding was less chunky. The theme worked better on the Caprice. What do you think of the Regal 2-door of the same period? The Regal is the more elegant and harmonical car for sure. But the Skylark has more character. When i sighted the Skylark Coupe for the first time – with his senseless pointy nose, the thin pillars of the roof and the aerodynamic style with the semi-hidden rear wheels – i thought one of the designers must be a former Panhard guy. For sure, this guy was later influencing the look of the GM EV1. That’s an ’80 skylark BTW. ’82 had headlamps in the normal position at the edges, and different taillamps without amber turn signal indicators. Inside the ’80 gauges were silver; later years used normal black. Now that is what I call detailed product knowledge. I had a stare at some Google images and made a stab at the date. Do you have a definitive photo I can reference? If so I´d be happy to correct the article and make a note to that effect. Do you run one of these cars by any chance or you owner of another Buick? We have a bit of a thing (I say we I mean I) about Buick here at DTW. You might like our articles about the “possible” future Opel Senator being based on Buick´s recent show car. Previous Previous post: Retro: Yes or No?